Rare Media Pin manufactured by RDZ (Robert D. Zweigle) limited to 3,000. 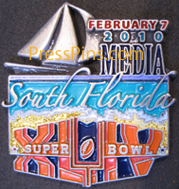 Super Bowl XLIV was held February 7. 2010 in Miami, Florida at the Sun Life Stadium. New Orleans Saints 31, Indianapolis Colts 17. Drew Brees MVP.